This month we made some important (and often requested) upgrades to e-mail, along with several other useful improvements. Recipient List. E-mail messages can (optionally) include a list of the recipients. Two deep leadership. 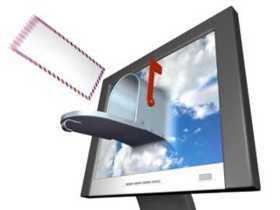 All email messages can be automatically CCd to two designated leaders. Reply All. The Reply All page now includes the previous message (including links to attachments) and allows you to add more attachments. New Reports for events and accounting. You may now accept fundraiser sales from the ScoutSales.org website without specifying a scout to receive credit. 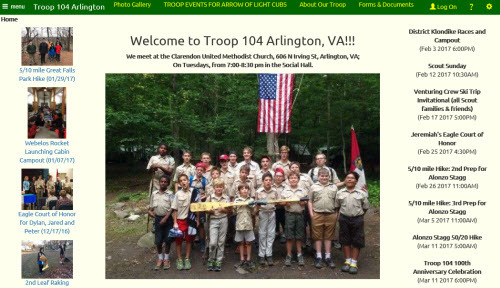 Troop 104 of Arlington, Virginia! Troop 104 shows that you don't need a fancy banner image to have a professional looking home page. We like the clean layout and tasteful use of special effects. Their "Adult Leaders" page is one of the best we've ever seen, and we love the custom page they developed for AOL Cub Scouts getting ready to cross over. They use their site both to communicate with their members and to attract new scouts, and they've done a nice job mixing the two.